Members have opened over 200,000 new credit card accounts over the 12 months to bring the total to nearly 12.8 million. 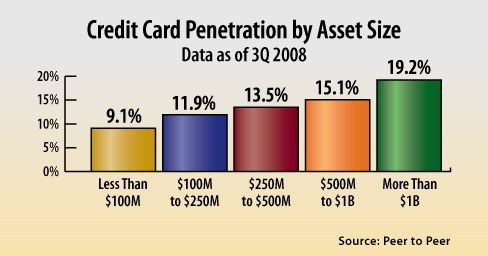 Credit card lending remains strong in credit unions. Balances are up 11.1 percent over the past year to an all-time high of $31.9 billion. Growth in balances has come from both new accounts and higher card usage. Members have opened over 200,000 new credit card accounts over the 12 months to bring the total to nearly 12.8 million. The average card balance has increased 10 percent over the past year to $2,500. How Did Credit Unions Perform versus Banks in 2006? Prudent management of the card portfolio is certainly important in today's environment, and credit unions continue to demonstrate success in this area. Balances have risen at a double-digit pace the past two years to reach an all-time high of $32B as of September. Asset quality also remains sound, with the credit union credit card delinquency rate at 1.6% (60+ days) vs 2.4% (90+ days) for FDIC-insured institutions. Annualized charge-offs show an even wider difference, with credit unions at 2.6% and FDIC institutions at 5.2% as of September.